Following in the wake of fellow AFL listed countrymen, Majak Daw at North Melbourne and Aliir Aliir at the Sydney Swans, two more Sudanese footballers have set their sights firmly on succeeding at the highest level. Their results at the recent AFL Draft Combine prove conclusively that they will give everything they have to give and more. Mabior Chol and Gach Nyuon (pictured) are both very similar in many ways. Both were born in Sudan and both saw their families flee their home countries and spend time in camps elsewhere. Gach’s family spent time in refugee camps in both Kenya and Ethiopia before his journey brought him to Melbourne as a seven year old. Mabior’s family also fled, via Egypt. Leaving the war in Sudan as a two year old, violence saw his family leave Egypt when he was eight for Brisbane. Sam Lansberger from the Herald Sun newspaper in Melbourne has written a detailed story about the boy’s journeys which was featured previously on World Footy News (see: Incredible Journeys From Africa To Australian Football) and is again worth reading in full to appreciate the incredible journey they have both travelled to date. But at the recent Draft combine, both boys excelled in their pet disciplines to the extent that they caught more than one or two passing eyes. In the Absolute Standing Vertical Jump, Mabior jumped 334cm whilst Gach jumped 330cm. In third place was possible number one draft pick Jacob Weitering with 327cm. This measures the height they jump from the ground to their highest point in the air at their fingertips from a standing start. The pair also took the top two spots in the Absolute Running Vertical Jump, but in reverse order. 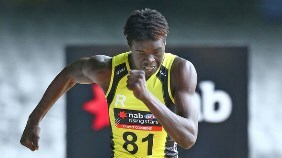 Gach took this event with a total jump of 362cm (equalling Nic natanui’s jump in 2008 prior to his drafting to the West Coast Eagles), shading Mabior at 357cm. Again Weitering took third behind the pair at 344cm. This event measures the distance from the ground to the highest point they reach in air with a running start. Both excelled in the Relative Running Vertical Jump with Gach coming second at 94cm and Mabior fourth at 90cm. Proving that it isn’t only jumping where they possess incredible athletic abilities, Mabior took second place in the 30m Repeat Sprints with a time of 24.30 seconds, just behind future star Daniel Rioli who recorded 24.15 seconds. He also ran an impressive 2.95 seconds in the 20 Metre Sprints. These performances may very well have caught many eyes, and in what is described as a “shallow” National Draft in November the boys might yet sneak onto a club’s Rookie List. But at worst, the pair have provided more evidence that the renowned athleticism found in sportsmen from a range of African countries is becoming a very neat fit with Australian Rules football.